Joe Bearman and Ross Jones have been banned for a tip-tackle during the on Friday. Number eight Bearman will serve a four-week ban while wing Jones is suspended for three weeks. The competition's disciplinary panel said the incident was at the "low-end entry point" for such offences. But the Ospreys were unhappy, saying they were "extremely disappointed with this outcome". Bearman's ban allows him to play again from Monday, 25 March so he can face Cardiff Blues at the Millennium Stadium on Saturday, 30 March. Jones' suspension means he can again take the field from Monday, 11 March and his first appearance after that could come against Newport Gwent Dragons at the Liberty Stadium on Friday, 22 March. The full Ospreys statement read: "Ospreys Rugby are extremely disappointed with this outcome, given the nature and outcome of other high profile recent incidents of a similar nature and the exemplary disciplinary records of both Joe Bearman and Ross Jones. 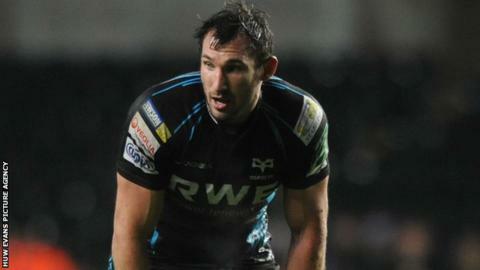 "There will be no further comment on this matter from Ospreys Rugby at this time." Bearman and Jones have been cited for a tackle contrary to Law 10.4(j), in the 27th minute. That law states: "Lifting a player from the ground and dropping or driving that player into the ground whilst that player's feet are still off the ground such that the player's head and/or upper body come into contact with the ground is dangerous play."